I want to share with readers my impressions and experiences on a recent trip through several parts of the Peoples’ Republic of China. I made the journey this June as part of my research for a forthcoming book on the Eurasian Century, my term for what is emerging as an alternative to a war-crazed West. Today’s China is far more complex than simply being the world’s great economic colossus, the so-called “workshop to the world.” Yet despite serious problems with the development path the country’s Communist Party leadership took beginning in 1979, when Deng Xiaoping opened China to foreign investment and a global market with a pragmatic market economy whose slogan was “Socialism with Chinese Characteristics,” China today is the key to any future positive world economic growth in a peaceful context. Unlike Trump’s demagogic slogan, “Making America Great Again,” China’s OBOR infrastructure undertaking is no demagoguery. It’s very richly real. Following a series of private discussions with Chinese experts at leading universities and think tanks in Beijing regarding the vast and changing complexity of the now Six Corridors of the One Belt, One Road port and land infrastructure complex under construction, my journey took me to the “origin” of the ancient silk route. I went to the central China city of Xi’an, some 1,200 kilometers west from Beijing. The Han Dynasty Emperor, Zhang Qian, opened the overland trade route more than two thousand two hundred years ago to trade valuable Chinese silks with the Mediterranean and the Roman Empire. It was named the Silk Road in the 1870’s by the noted German geographer Ferdinand von Richthofen. The trade route linked the then-highly advanced cultures and civilizations of China, India, Persia, Arabia with Greece with and Rome. It’s important for Western observers to realize that this very old history is very living and real for the cultural memory of today’s China. It’s not at all forgotten, and it shapes very much the vision of the OBOR initiator, President Xi Jinping. It is clear to me after many conversations with Chinese of all backgrounds that they realize acutely how significant the potential of this OBOR development is becoming to lift the world out of ever-more destructive wars into a long term period of rising living standards and peace. Today’s Chinese are also acutely aware of the fact that the West and her allies used opium to loot and destroy China from the time British and American trading companies launched the 1840 Opium Wars, until the founding of today’s Peoples’ Republic of China by Mao Zedong in 1949, with the defeat of the opium-pushing Japanese occupation and the opium-running Koumintang of the US-backed dictator, Chiang Kai-shek. In part, today’s “opium” takes the form of Gucci handbags and Buick autos and iPhones—all made in China. Nothing noble can be built up without an essential grand vision. This the OBOR clearly has. First it’s unmistakable that China envisions the multi-nation OBOR project as an integral part of moving the world away from what they see as the tyranny of a dollar world. OBOR is far more than a few ten thousands of miles of high-speed rail track or some new deep water container ports around Asia. As they rightly see it, so long as the US dollar remains the key reserve currency for the vast value of world trade, world central banks will be forced to accumulate dollars to purchase oil, commodities, machinery even gold and to unwillingly finance America’s wars, wars ultimately against their own national interests, whether against Iran or Qatar or North Korea. That petrodollar recycling era, as Kissinger originally dubbed it, seemed to work astonishingly well for Wall Street banks and their military industry complex for more than four decades. 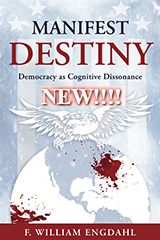 Those glory days are drawing to a close, and with it, the unfortunate concept of an American Century created out of the ashes of World War II, as what some call an informal empire, one that has been based on control of debt and of money of other nations. China is understandably discreet about its views of displacing the dollar with the Renminbi. Nonetheless, it is clearly integral to the OBOR strategy. And that would be very positive for the world as Washington would be forced into real choices between guns or butter. The Chinese economics expert then pointed to the fact that Iran no longer sells its oil to China in dollars; that China and Russia use their national currencies to settle energy purchases, and that even Qatar, home of Washington’s largest military base in the Middle East, sells its LNG to China in renminbi, not dollars. My next stop was Xi’an, a bustling beautiful modern city of more than 9 million. It is most known to the world as home of the recently-unearthed Terracotta army ruins. Today the city is home to major research and development labs, to installations of national security, and China’s space program. Xi’an is also home to the largest railway terminal in Asia, a high-speed terminal with China-build high-speed, sleek trains constantly coming and going in every direction towards Mongolia, Beijing, Kunming in the South to Kazakhstan and Russia on to the EU. The Xi’an high-speed terminal building was completed in 2011, and is one of the most modern I’ve seen anywhere, with fully electronic departure/arrival information in Chinese and English. From Xi’an my journey took me to see one of the new deep water ports being developed as the “belt” component of the One Belt, One Road. The port was Qingdao, in Shandong Province on China’s east coast opening to the Yellow Sea on a parallel with South Korea. Qingdao itself is another modern city of more than 9 million. The city Qingdao has been a designated Special Economic and Technology Development Zone (SETDZ) since 1984, and is now China’s tenth city in terms of annual GDP. The harbor of Qingdao consisting of Dagang Port Area and the Qianwan Container Terminal, at present is China’s fourth largest port. It is already handling more annual freight container traffic than the ports of Hamburg and Antwerp combined. In 2015 Hamburg, Germany’s largest port, handled 9-10 million TEU of containers. Qingdao did 18 million TEU. The Qingdao port is presently undergoing a massive expansion in the context of the OBOR sea lane development. It can handle the world’s largest container ships as the first fully-automated container port in Asia. The port also is linked by rail to the EU markets via Russia. I was told by Port authorities that the present sea route to Europe from Qingdao takes much longer, 40 days compared with 15 days by rail. However rail costs per weight about twice as much. The strategy then is to ship low value added bulk commodities by sea and high-value such as computers, smart phones and such by rail. The port complex is an all-purpose fully-automated harbor able to handle raw commodities such as iron ore, coal, oil or even LNG from Qatar and elsewhere. 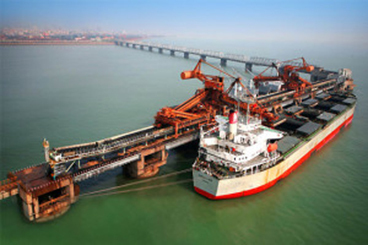 The port, outside the City is connected to the industrial city center by a 41 kilometer long bridge, Qingdao Haiwan Bridge, part of the Jiaozhou Bay Connection Project, the world’s longest bridge over water, completed in 2011. As that Obama Asia Pivot policy was read in Beijing, combined with the Obama anti-China Trans-Pacific Partnership trade talks, it was viewed as a US move to militarily and economically contain China. That Obama Asia Pivot clearly in retrospect was the event that catalyzed what is today the One Belt, One Road multi-trillion dollar international series of economic infrastructure projects that are transforming the economic space now of the entire world economy. Five months later, after Washington pulled off what Stratfor’s George Friedman called “the most blatant coup d’etat in US history,” toppling the Russia-friendly elected Ukraine President Viktor Yanukovych with a gaggle of Russo-phobic oligarchs and neo-nazi thugs, Russia began an historic pivot of her own, the pivot towards strategic cooperation with China and with China’s new Silk Road. Perhaps the ill-tempered State Department neo-con Victoria Nuland ought to be credited. Her stupidity and that of her colleagues in the Obama Administration made possible Zbigniew Brzezinski’s worst geopolitical nightmare: the coming together of the nations of Eurasia in a peaceful economic cooperation that will dwarf the stagnating, debt-bloated economies of the United States and that of most of the EU. We do really live in interesting times.